In a speech on 15 November 2007 the Foreign Secretary (David Millband) said: "the European Union should work towards including Russia, the Middle East and the North African countries." He continued that the EU would not become a super power but should be a role model for the rest of the world. "The EU could be a model of power for regional co-operation, dedicated to free trade, the environment and tackling extremism." 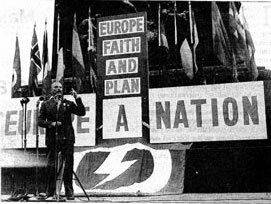 Mosley's British Union of Fascists was the first political party in Britain in 1949 to call for a European Union. This union was to include parts of North Africa in "Europe". The fascist dream was and remains a "comprehensive policy for the new Europe"- "the complete Union of Europe with an European Government is now a necessity...an entirely free system, in a large and viable area such as Europe-Africa, could solve the recurrent crises of the present European countries..."
Mosley edited a magazine, "The European", between 1953 and 1959, which called for a "Union of Europe", proclaiming himself leader of the Union Movement which campaigned for "Europe a Nation". Sir Oswald promoted the Nazi vision of a world divided up into self-sufficient, autarkic, blocs which would be corporatist in character, which would deny the existence of class struggle. As such, there are many similarities with Euro-fascist visions and those of ardent Euro-federalists. Mosley's paranoid European ideology also called for the creation of a Euro-African "great living space" (Lebensraum in Nazi terms) while excluding imports from third world countries, a concept which remains intact in EU dealings with the ACP countries, the former colonies. The lasting attraction of the big ideas of empire and imperial power are still proving to be seductive to political elites within the European Union and beyond. Judge for yourself the difference between the call by Moseley and the Foreign Secretary in the last Labour Government. This idea has been repeated in the period of the 'Arab Spring' in North Africa and Arabia in 2011. Note - David Miliband's Grandfather Samuel Miliband fled to England from Belgium before the second world war and at first was refused the right to remain. David's father Ralph Miliband was born in Belgium he came to England and joined the Royal Navy. Later he became a Professor of Politics at Leeds University and lectured at the London school of Economics.